This is the popular chickpeas (garbanzo beans) curry from Kerala. It is made at least once every week in most kerala homes. 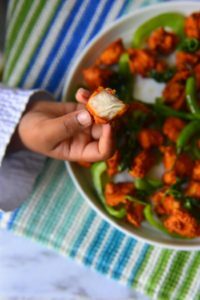 High in protein and flavors this is perfect accompaniment to serve with the popular break fast sides like puttu, appam or idiaappam. This time it was served with the popular steam cake – Puttu. Kadala or the black chickpeas are the star here. The curry is made with the usual base of onion garlic , ginger and chilies with tomatoes or tamarind for tang. 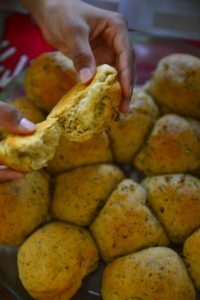 Like many recipes from this regions it too is vegan . Dry chickpeas take a long time to cook , and are for hours (usually overnight) before cooking. This long cooking time makes it the perfect candidate for Instant pot. Whether using IP or not soaking gives predictable results when cooking beans. An added advantage is that is that soaking gives you a uniform cooking time – when the beans are dry and aged it is difficult to estimate the time to cook. You can cook the beans without the long soaking , but the catch here is that the cooking time will vary quite a lot depending on the age and dryness of the bean. If not soaking I would add increase regular cooking time by at least 30 minutes or high pressure cooking time by about 15 to 20 more minutes. Not a fan of Instant Pot ? The directions for traditional cooking is given below the recipe. Should I use the soaking liquid ? There are a few reasons to discard the soaking liquid. Back in the days when the procurement and storage of beans were not as tightly controlled, this was a good way to clean out all that dirt and grime that could be stuck to the beans. Beans are processed and stored in much more hygienic conditions toady and soaking for a few minutes and giving a good rinse is going to accomplish the same. The other reason for throwing away the soaking liquid is to remove some the soluble carbs that may cause digestive issues. But it still leaves behind other ingredients that are not water soluble and could cause the same issues. Another thing to keep in mind is that the soaking liquid contains other beneficial nutrients as well. From a culinary stand point the soaking liquid has a lot of flavors. So when I am cooking for the family often times I soak the beans for just a few minutes , give it a good scrub and rinse. The beans are soaked in fresh water for 8 hours and use the water in cooking. The recipe here is going to say discard water and that is the standard practice when you are cooking for guests. These are all the ingredients to make Kadala Curry except coconut milk. It is not heavy of spices, but the flavors are unmatched. 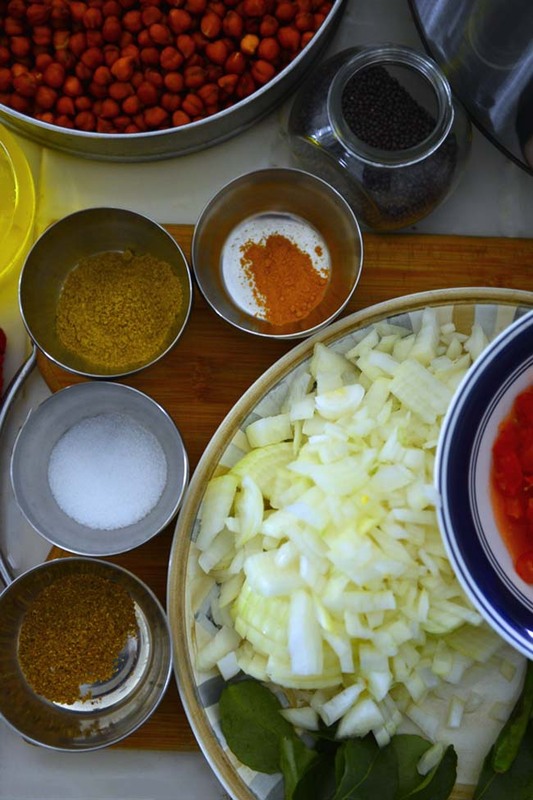 Once you have all the ingredients in place making the curry is a breeze. Kadala curry can be made using coconut milk or not. 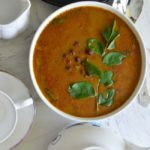 This instant pot version is kadala curry with coconut milk. Coconut milk adds to the body of the curry and binds the spices and the liquids together. The version without coconut milk is thinner , more watery but still tastes great. Traditionally curries like these are made with fresh squeezed coconut milk. The chickpeas will get cooked in the thin milk and the thick milk will be added towards the end. Typically this dish is made with brown chickpeas. These can definitely be made with the pale yellow variety as well. In South India the commonly available chickpea varieties have darker colors, and these are usually a little smaller than the pale yellow counterparts. Since this curry is usually served with carbs (rice, appams, etc. ) that are predominantly white in color , the brown versions provide an appealing contrast. 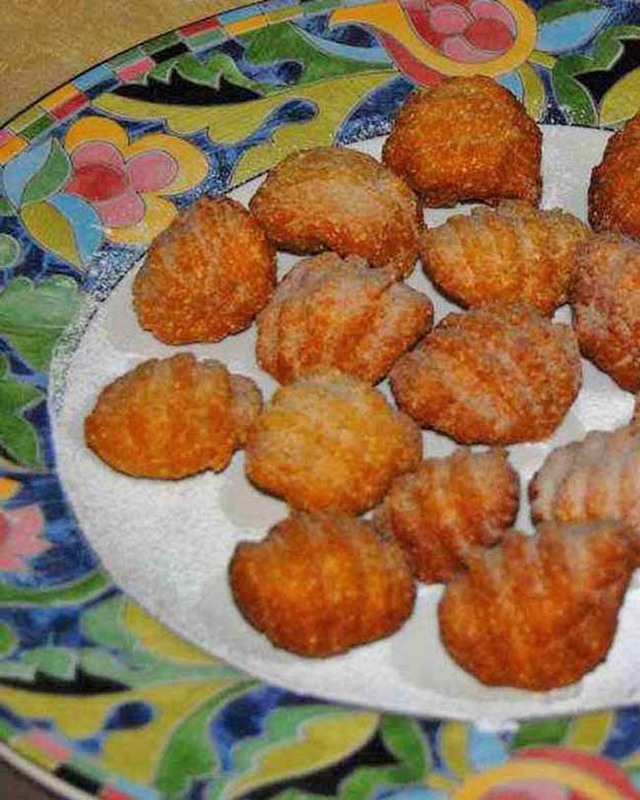 Make these with yellow garbanzo beans if that is what you have. What goes well with this kadala curry ? Keralites love kadala curry with the popular breakfast steamed rice cake – Puttu. It goes well with appam , Idiappm ( fresh made rice noodles), and even ghee rice or lemon rice. Try it with pathiri or jowar roti or any flat bread. 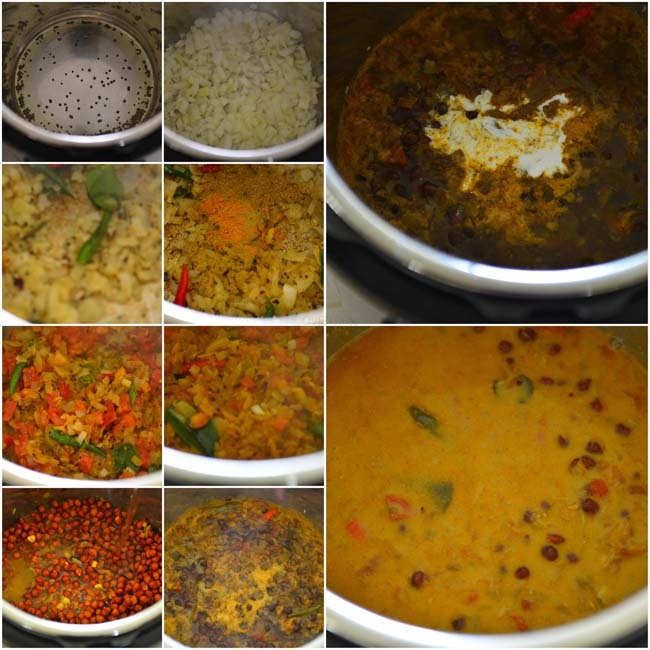 These are the step by step pictures of making Kerala Style Brown chickpea curry in the Instant Pot. 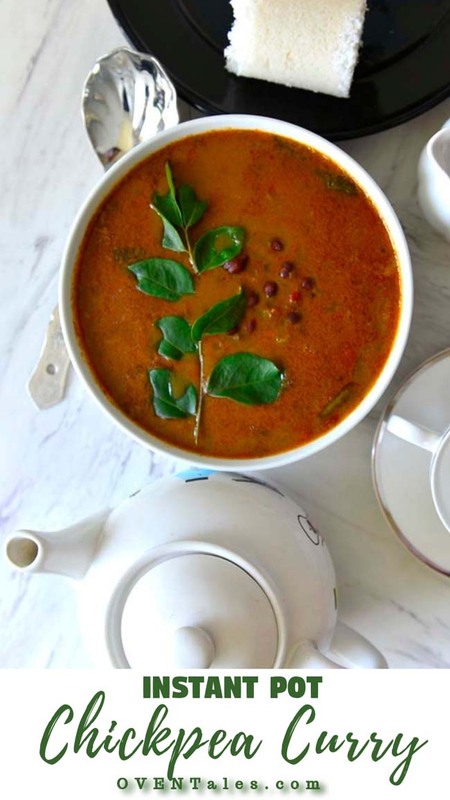 This black chickpea curry is a popular dish in Kerala and the Konkan region. Flavors of coriander coriander and coconut goes well with chickpeas. Serve it with any of your favorite flat breads or rice or with traditional Kerala breakfast like - appam , puttu or idiappam. Wash and soak the chickpeas in plenty of water overnight. Drain, rinse and set aside. Finely chop the onions , mince the ginger and garlic and finely chop the tomatoes. Slit or chop the green chilies small if you like the curry to be spicy. Leave them whole for flavor. Press the sauté button on the Instant pot and add oil . When the oil gets hot add the mustard seeds. When the mustard starts spluttering add the curry leaves. Sauté for 30 seconds until the leaves turn crisp and the mustard seeds stop dancing around. At this point you can scoop up some of the seeds and leaves and reserve – but leave the oil behind. Add the copped onions to the pot. Sauté for about 4 minutes stirring in between till the onions begin to turn brown . Add chilies, ginger, garlic and spices. Stir fry for 30 seconds. Add the chopped tomatoes and mix well . Cook for a minute until the tomato begins to break down . Add the chick peas and 2 C water. Set the Instant pot to cook on Manual with high pressure for 20 minutes . Release pressure naturally (Notes). Open, stir, taste and adjust salt. Add coconut milk and sauté for 2 to 3 minutes until the curry begins to boil. Coconut oil is preferred in this recipe , but any neural oil will work as well. Garam Masala or Meat Masala is used to add some aromatic spices to the recipe. It is optional , but do not leave out the coriander powder. If using fresh coconut milk – use the thin milk to substitute part of water used for cooking the chickpeas. Use 1/3 C of coconut cream or thick coconut milk. If using regular coconut milk can, open it without shaking the can and skim off the thick milk. Tamarind is often used instead of tomatoes. Use about 1 tsp of tamarind paste or a small piece of tamarind ( 1 to 2 cm) soaked in ½ C cup water. It is important that the onions and tomatoes are chopped fine. It aids with even quick cooking. You can release the pressure about 15 minutes after the chickpeas are done cooking. Not a fan of high pressure cooking ? 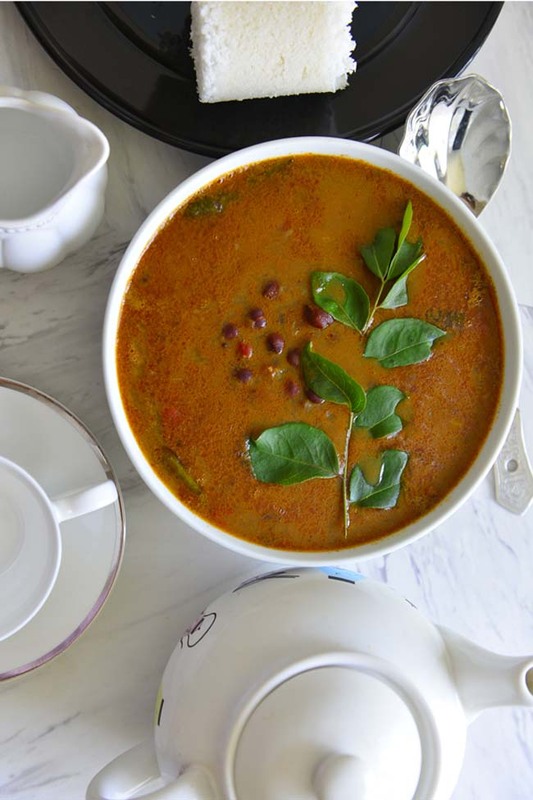 Here is how to make the kadala curry in a more traditional way. Cook the chickpeas in plenty of water with a pinch of salt until cooked through – use your stove top pressure cooker or stockpot. In a sauté pan add coconut oil and follow the directions for the instant pot. Once the tomatoes soften add the cooked chickpeas and simmer for 5 to 10 minutes. Adjust salt and finish with coconut milk. It takes longer , but the process is the same.